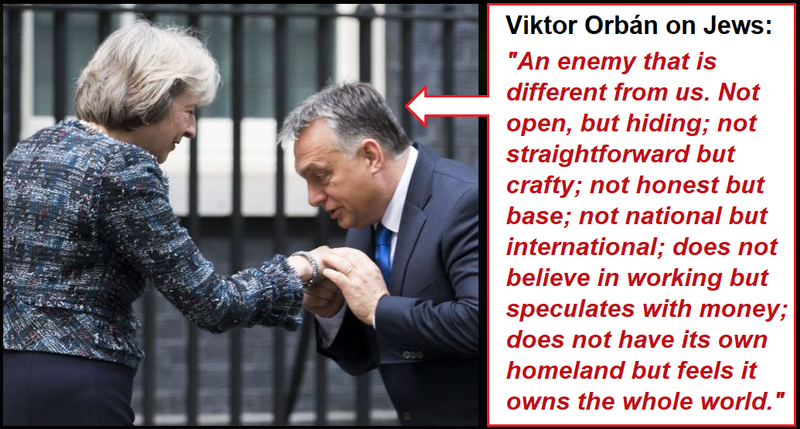 One of the first world leaders Theresa May met after she was appointed Prime Minister was the fanatically right-wing Hungarian Prime Minister Viktor Orbán. Since then the Tory party have continued to cosy up to Orbán and his anti-Semitic, xenophobic, judiciary-rigging, free speech-attacking regime. After Orbán retained power in the 2018 Hungarian elections which featured a massive anti-Semitic poster campaign the then Foreign Secretary Boris Johnson Tweeted gushing praise for Orbán and his party. And in September 2018 Tory MEPs in the European Parliament sided with all the exreme-right nasties in Europe (Front National, Golden Dawn, PiS, PVV, AfD, Swedish Democrats, True Finns, FPÖ, Lega Nord, and Britain's own UKIP) in order to defend Orbán's government against a motion of censure that was overwhelmingly supported by the European centre (from conservatives, through liberals to the socialists and greens). The Tories were the only (supposedly) mainstream government in Europe to ally themselves with Orbán and the extreme-right. Here's one of Orbán's most notorious quotes about Jews: "We are fighting an enemy that is different from us. 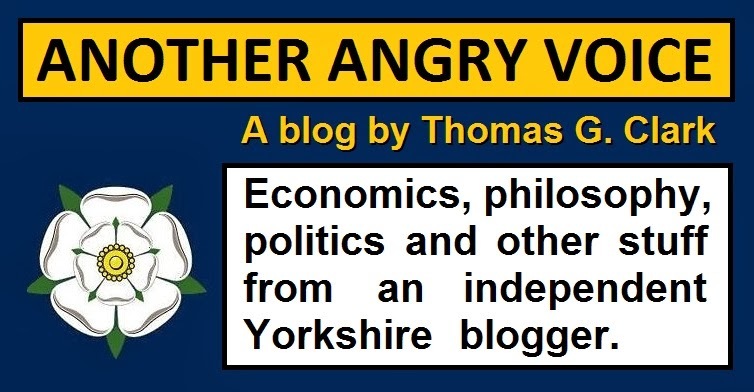 Not open, but hiding; not straightforward but crafty; not honest but base; not national but international; does not believe in working but speculates with money; does not have its own homeland but feels it owns the whole world". Isn't it extraordinary that the mainstream media spent the entire summer digging around in Jeremy Corbyn's past to cherry-pick absurd out-of-context quotes, fixate over images of him laying a wreath (at a graveyard where none of the Munich terrorists were even buried), and even smear a Jewish Holocaust survivor as an anti-Semite to paint Corbyn as an anti-Semite ... but when yet more evidence of the Tories' active collusion with a horrifically right-wing government led by an unmistakably anti-Semetic tyrant comes to light, suddenly the mainstream media anti-Semitism guns have fallen silent? Orbán's extremism isn't just limited to anti-Semitism either. He's continually attacked Muslims as "invaders", he's been rigging the Hungarian judiciary by stacking it with pro-government figures, he's clamped down on free speech and attacked the free press. His supporters have even drawn up a blacklist of charity workers, campaigners, journalists, academics and other public figures considered "enemies of the state". It's quite incredible that Theresa May and the Tories have openly colluded with this vile regime right in front of our eyes, for years, safe in the knowledge that they won't be held to account for it by Britain's docile, compliant, and ridiculously right-leaning press. Even now, when the Tories' scandalous support for this vile regime is incontestably recorded in the voting record of the European Parliament, there's nowhere near as much condemnation and noise from the people who were howling at Corbyn, and making hyperbolic accusations that Labour are an "existential threat" to Jewish people just a few weeks previously. Instead of vehemently condemning this outrageous Tory collusion with one of the most notorious anti-Semites in Europe, the Jewish Board of Deputies expressed only "disappointment"! Others to have whipped up the anti-Semitism furore to attack Jeremy Corbyn and undermine the momentum towards genuine democratic socialism haven't even said a word. The day after this Tory collusion with Orbán, Jonathan Sachs stood up in the House of Lords to talk about anti-Semitism and didn't even mention it! 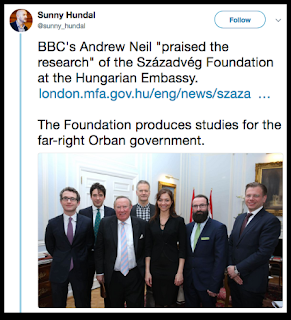 BBC heavyweight Andrew Neil, who has repeatedly pushed the anti-Semitism attacks against Corbyn remained silent, which is hardly surprising given his personal involvement with the Hungarian government. All of this raises the question of how stupid and gullible they think we are. They seem to imagine that they can manipulate us into believing that the lifelong anti-racist campaigner Jeremy Corbyn is the Jew-hater, whilst they actively turn a blind eye to Theresa May and her party repeatedly sucking up to the most notorious anti-Semite in Europe! In reality this is such a spectacular display of over-reach that swathes of the mainstream media are permanently wrecking their own reputations. Repeatedly trying convince people that black is white is bad enough, but then after posing as valiant anti-Semitism campaigners for the entire summer of 2018, their deafening silence on the Tory collusion with Orbán clearly exposes their political partisanship and their utter hypocrisy. If you decide to present yourself as a valiant anti-Semitism campaigner all summer, then you'd better not turn a blind eye to it in the autumn when your political allies are up to their necks in it, otherwise you've just burned your journalistic reputation to the ground. Anti-Semitism is a vile form of racist bigotry that needs to be confronted wherever it's found. It's not a convenient issue to be weaponised and used as political ammunition, only to be immediately forgotten about when your political allies decide to defy the European political consensus and actively support the most notorious anti-Semite in Europe. This political weaponisation of anti-Semitism is particularly disgusting because it cheapens the fight against anti-Semitism by making the issue seem like partisan political point scoring, rather than a serious problem that need to be confronted wherever it arises.